The title of this blog is a bit of a stretch... it's hard to say if Route #11 was the favourite bus of spies but it was definitely the route that showed up twice in the MI5 files (so far). When double agent TATE (Wulf Schmidt) radioed the German Abwehr in Hamburg that he desperately needed more money, they suggested a complicated rendezvous on Route #11 which involved Victoria Station. TATE replied that Route 11 didn't pass by Victoria (rather strange as it most certainly did) and suggested Route 16 instead. Around the same time, in early 1941, undiscovered spy, Engelbertus Fukken was taking Route #11 from Liverpool Station to Ludgate Circus and back. The tickets for his journey were found amongst his possessions after his suicide in an air raid shelter in Cambridge in late March 1941. Ticket #7974 (2d) - This ticket was issued on the 10th., March 1941, on a Route 11 Bus, leaving Liverpool Street on a journey westbound. The time of issue of the ticket would be a few minutes after 2-6 p.m. on the same date. The ticket would be available to Charing Cross. 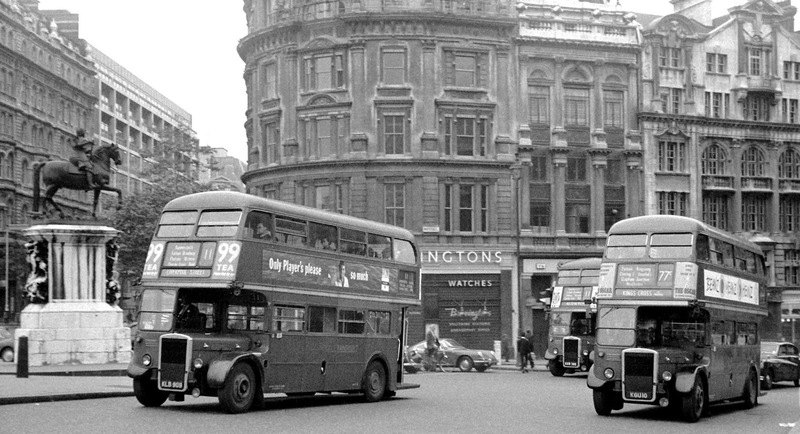 Route 11 was, and still is, London's most famous bus route and with good reason. The route, originating near Shepherd's Bush and terminating at Liverpool Street, passed many of London's most famous sites. If one wanted to take a sightseeing tour of London, Route 11 was an excellent choice. It passed through Chelsea, stopped at Victoria Station, wandered past Westminster (including Westminster Abbey, Parliament, Big Ben and Downing Street), skirted Trafalgar Square and trundled past St. Paul's Cathedral and the Bank of England before terminating at Liverpool Street. 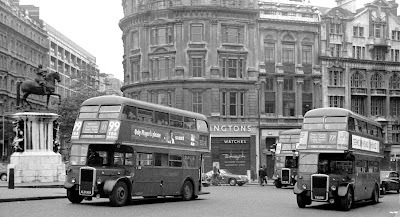 According to the London Transport Archives, the route, every day from 1941 to 1970 (with the exception of Coronation Day - 6 June 1953) was: Shepherds Bush, Hammersmith, Fulham, Waltham Green, Chelsea, Sloane Square, Victoria, Westminster, Trafalgar Square, Aldwych, Ludgate Circus, St Paul's Cathedral, Mansion House, Bank and Liverpool Street. A reconstruction of the route based on those stops would most likely look something like the map below. Engelbertus must have been an adventurous soul to venture out onto the London bus system with his less-than-stellar identity papers. Was he to meet someone? Did he make other trips to London in the months before his death, trips for which he did not keep the tickets? Hard to say, but a tantalizing mystery. London Transport Archives - thanks to Tony for previously researching the wartime route for Route 11 buses. Self-Preservation Society - anything and everything to do with old buses.